(www.ezracers.com) got underway in Mid August with a bicycle ride from Catskill New York to the Delaware Water Gap. He is now in Virginia Beach and will start south on Route 17 this Saturday. “17, which I’ve not seen, is a natural as it goes from Virginia Beach to South Florida and travels through many towns”. The ride will end in either Fort Meyers or Key West Florida and is sponsored by Kaffe Magnum Opus (www.kmocoffee.com), the national coffee roaster (www.kmocoffee.com). Bob’s wife Cathy is supporting the ride with their Phoenix Cruiser motor home, and his brother Paul supplied some important motivation. They have a model 2551 that is perfect for a couple with a dog (Ruby). Several years ago Bob and Cathy rode from Buffalo to Albany along the Erie Canal on the Erie Canal Ride of 2001 or thereabouts. Cathy decided to support the ride, find camp grounds, site see a bit and generally keep it organized. “This would not be possible if it were not for Cathy”, said Bob. Ruby, their standard Schnauzer joins them on all trips. The standard Schnauzer is a combination of the German Poodle and the Wo lf Spritz. It’s a loving and protective friend and a member of the AKC Wo rking Group. “Ruby is a Traveling Dog, she goes where we go and is a willing participant”, Cathy said. Cathy is training Ruby. So there is a natural connection between the sponsor and the Ride for Independent Coffee Houses. Bob said “I hope that other coffee independents will join me along the way’. The ride also supplies an ideal opportunity to get in shape. Bob is 61 and ‘getting ready for final third of my life”, he says. “I decided to use the ride as a vehicle to get healthier and it is working”. He continued very proudly “two belt notches in the first five weeks”. Starting in the Catskills was a bit tough going and the daily mileage was low. But on the flats of the Eastern Shore of Virginia the mileage is increasing to 40 and 50 miles per day. “This isn’t a race and I’m not a 90 mile a day person” said Bob. Bob is riding a Tour Easy one of models in the EZ Racer line of recumbent bikes. This bike is outfitted with thin tires as the entire ride will be on well maintained roads. He is using the ERRC small under-seat bags for water and spare clothing, but he sleeps each night in the motor home. 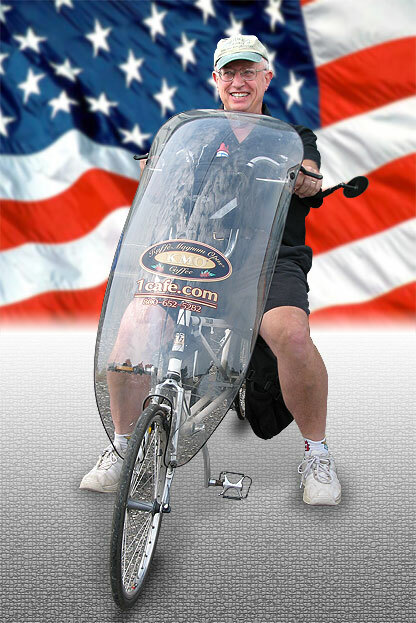 Bob and his wife Cathy have owned Tour Easy bikes for four years. “The under seat bags are a big help is maintaining stability on the road. 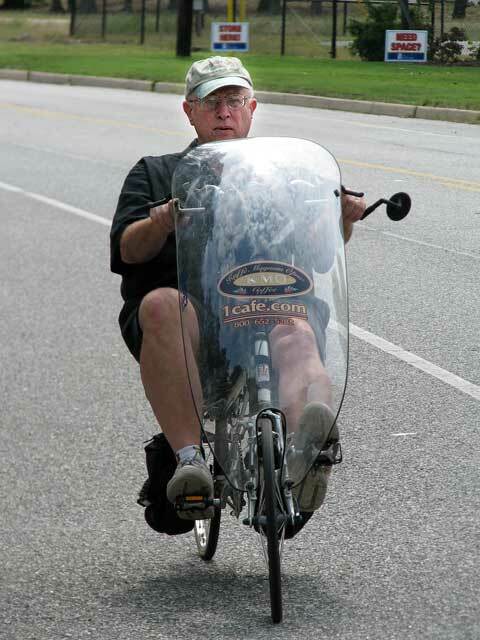 They keep the weight low and the low center of gravity is good to have when roaring downhill at 35 miles per hour. The same is true for tight or rapid turns, especially when you don’t expect them. 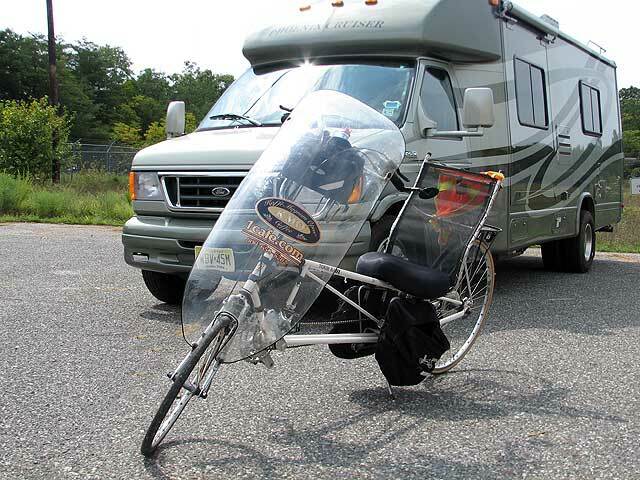 I have both sizes, the smaller ones I’m using on this trip and I have the large ones for self contained rides. I use them in the winder to carry gear and to put warmer clothing as I “un-layer”, continued Bob. Bob’s brother Paul played an important role in my life and he wanted to include him on this ride. “Perhaps we can figure out how to do it in California ”. Paul requires a wheelchair to get around and provides a role model for folks who want to achieve something special, like open and operate successfully a coffee house or café. Paul’s story is unique. He was born with a congenital condition yet to be diagnosed, so he does not fit a stereotype. And his life is anything but ‘run of the mill”. There are no joints in his frame that behave as we expect, so moving about has required some ingenuity. For example, lifting and positioning his wheelchair in the car without muscles, essentially just tendons, is quite a feat. Paul has always lived on his own and has devised ways to do every day chores without assistance, although “I’ll take a little help from my friends any time”, he says. “I thought about a ‘Bob’ trailer or a people trailer but neither was particularly appropriate for Paul”. Paul is 55 and an accomplished independent person. “If there is a side car or similar fitting, that might work”, say Paul and Bob. Both say ideas and options are welcome. Bob has two children. Jennifer is a Supervising Producer on the CBS show Cold Case. His son Paul expresses his creativity through construction of ponds, waterfalls, pool decks and the like. Cathy and Bob love their five grand children. Ingrid is Jennifer’s daughter, and Maggie, Jacob, Marli and Luke are Paul’s. Please use these or any picture on the site with restricions.